The Right Reverend Samuel L. Green, Sr. 125th Elected and Consecrated Bishop African Methodist Episcopal Church Presiding Bishop of the 7th Episcopal District. The Rt. Rev. Samuel L. Green, Sr., is the son of the Late Reverend and Mrs. Henry E. and Irene W. Green, born August 31, 1960 in Tampa, Florida. Bishop Green was nurtured by his late parents in strong religious and moral values, along with his sister Minerva Green Miller and four brothers; Retired Master Sergeant Paul Green and the Reverend Drs. Henry, John and David Green. He is the father of three sons: Adam, Samuel, and Stephen. Bishop Green was reared in the state of Florida, where he received his formal education. Like the prophet Samuel in the Old Testament, the Rt. Reverend Samuel L. Green Sr. was very young when he first realized his calling into the ministry. No supernatural acts of God were necessary to compel him to serve. “There was no light or anything like that,” Bishop Green said. “It was just an assurance that I had that this was what God wanted for me to do with my life.” By the time he was 17, he was already preaching and touching the lives of others, but Bishop Green faced challenges in his early walk. Living in a way that pleased the Lord was a challenge for him as a teenager. He felt pressure to join his friends in activities that he knew would undermine his spirituality. He also faced doubt and criticism because of his youth, inexperience and desire to revolutionize the structure of the church. Bishop Green has been inspired to take daring new approaches, including more open worship and a ministry specialized for individual needs. Under Bishop Green’s direction, St. Mark African Methodist Episcopal Church in Orlando, Florida, added a daycare facility and preparatory school. He served the church from 1988 to 2004, and in honor of his dedication to furthering the kingdom of God; the church renamed the Family Life Center to the Samuel L. Green Sr. Family Life Center during his final month there. He has also held pastorates at two other Florida churches: Mt. Zion A.M.E. Church in Green Cove Springs and Mt. Zion A.M.E. Church in St. Petersburg. Over three decades after accepting his calling, the same passion to lead others to a closer relationship with Jesus exists within Bishop Green’s soul. 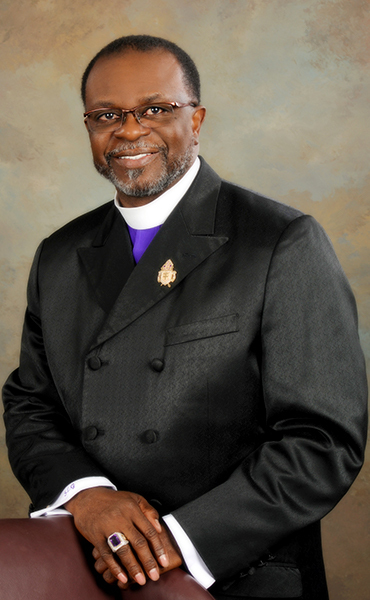 He is one of the 21 active elected and consecrated bishops of the African Methodist Episcopal Church, served as the Presiding Bishop of the 12th District, which encompasses Arkansas and Oklahoma, and now serves as the appointed Presiding Bishop of the 7th Episcopal District. He views the church as a proponent of change. In his opinion, meeting the needs of the community is a priority, from housing to job training to educating our youth. Bishop Green has a special interest in reaching out to the youth in a way that allows them to express themselves and offers them a refuge within the church from negative influences, such as gangs. One of his recent projects is the rejuvenation of the young adult and youth ministries. Under Bishop Green’s guidance the credibility of the AME Church’s only Junior College, Shorter College has been restored. Upon Bishop Green’s arrival to the 12th Episcopal District, Shorter College was unaccredited. However, on October 29, 2013, Shorter was awarded Full Accreditation Status from the Transnational Association of Christian Colleges and Schools (TRACS). TRACS is an accrediting agency, which is recognized by the United States Department of Education (USDE), the Council for Higher Education (CHEA), and the International Network for Quality Assurance Agencies in Higher Education (NCAAHE). Attaining the status of full accreditation qualifies the institution for access to higher levels of resources and support, such as: Facilitates the college’s participation in the Arkansas Library System Qualifies the institution for full recertification by the Arkansas Department of Higher Education as one of its 17 private independent institutions.